College football action on ESPN2 will take place in Jonesboro, Arkansas on Tuesday at 7 p.m. EST. The Arkansas State Red Wolves will host their first nationally televised football game in the history of the program. The Blue Raiders of Middle Tennessee State will be the opponent in this Sun Belt Conference matchup. Both teams have had a bit of a disappointing year, but I would expect them to be ready for a game like this on a national stage. The Middle Tennessee State Blue Raiders are just now getting accustomed to having their star quarterback in the lineup. Dwight Dasher was the preseason Sun Belt Conference Player of the Year, but he was ineligible for the first four games this year. Dasher has been extremely rusty since he returned, but he is still a very talented player. Dasher is quite effective as both a runner and a passer. The Blue Raiders have plenty of talented running backs on this unit. Phillip Tanner is the leader of the group, and he averages 5.4 yards per carry this season. In order for this offense to reach its full potential, the wide receivers on this team will have to step up. Arkansas State lost a ton of talent after last season, but their offense has still been solid this year. Quarterback Ryan Aplin is the main man for the offense, and he has done a nice job leading the team this season. Aplin has 13 touchdown passes on the year and he also leads the team in rushing attempts. Dwayne Frampton gives the Red Wolves a reliable target at the wide receiver position. Arkansas State has been solid in the passing game this year. However, they need the running game to improve. Middle Tennessee State’s defense has been mediocre this year. The secondary has several veterans and they have done well to hold down the opposition’s passing attack. The front seven has been a disappointment this season. The defensive line does a nice job pressuring the quarterback, but they lack the run stuffer in the middle that is necessary against the best running teams in the nation. Arkansas State isn’t a strong running team, so I expect Middle Tennessee State to bring a lot of blitzes in this game. The Arkansas State defense was good last year, but they have struggled mightily this season. The Red Wolves have an extremely young defense, and they have shown their inexperience this year. How bad have they been? This defense comes in ranked at number 116 out of 120 defenses in all of college football. They allow about 200 yards per game on the ground, and 255 yards per game through the air. This defense will be tested in a big way on Tuesday night. Arkansas State opened as 2-point home underdogs, but the line is slowly moving in their favor. They are now being given 1.5 points in this Sun Belt Conference clash. The betting public hasn’t committed too much cash on this matchup just yet. I expect more line movement as the kickoff time approaches. 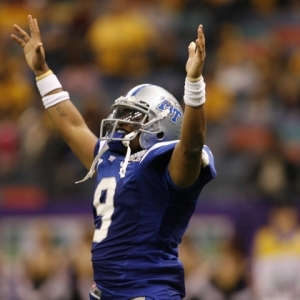 Middle Tennessee State has won seven of the last eight meetings between these two teams. The Blue Raiders are 6-1 ATS in the last seven meetings between these schools. Arkansas State is on a nice 4-0 ATS run in their last four games overall. The ‘under’ is 5-0 in Middle Tennessee State’s last five games. The ‘under’ is 21-10-1 in Arkansas State’s last 32 games overall. The Arkansas State fans will be fired up for this one, but this Red Wolves defense will struggle against Dwight Dasher and company. I think this is a game where quite a few points will be scored. Look for Middle Tennessee State to wear this team down in the second half and win this one. Looking for a premier college football handicapper for winning college football picks? Look no further than Jason Sharpe. Sharpe has already picked up nearly $7,000 for his football clients and he has another big card this weekend as he has shown a profit in nine of 10 football weeks thus far. Find out why this professional Vegas bettor is terrifying the bookies in Sin City and across the globe. Call Doc’s Sports toll-free at 1-866-238-6696 to get a free week of Sharpe’s picks or any of the other fine college football handicappers at Doc’s Sports (new customers only).